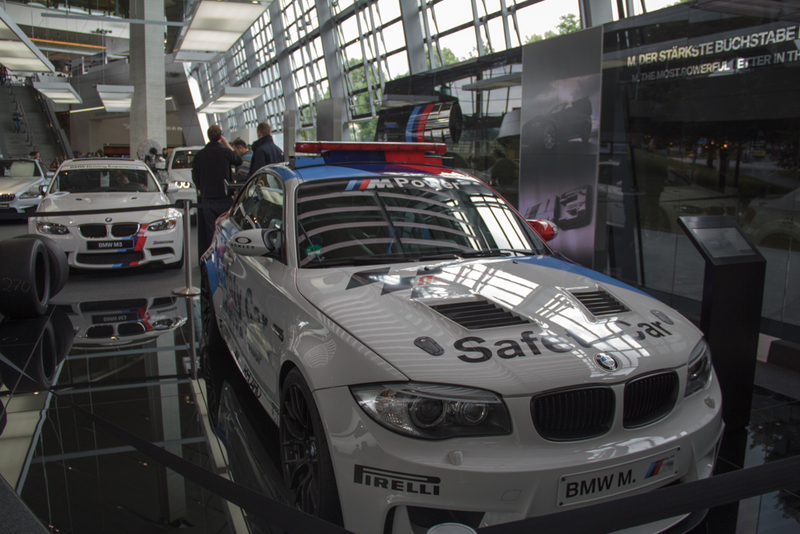 BMW World – Sunshine. Whimsy. Tacos. 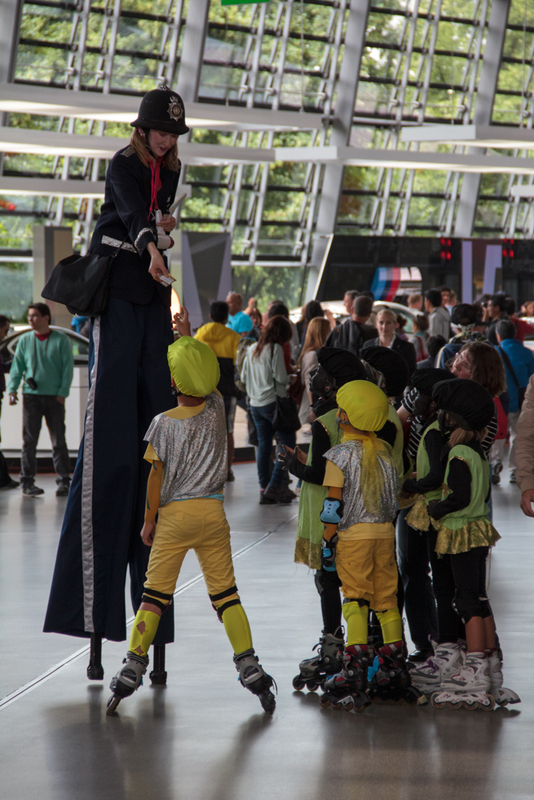 I visited BMW Welt (World) with Jenny and her merry band. BMW Welt is a tourist attraction in Munich, at the entrance to the Olympiapark. 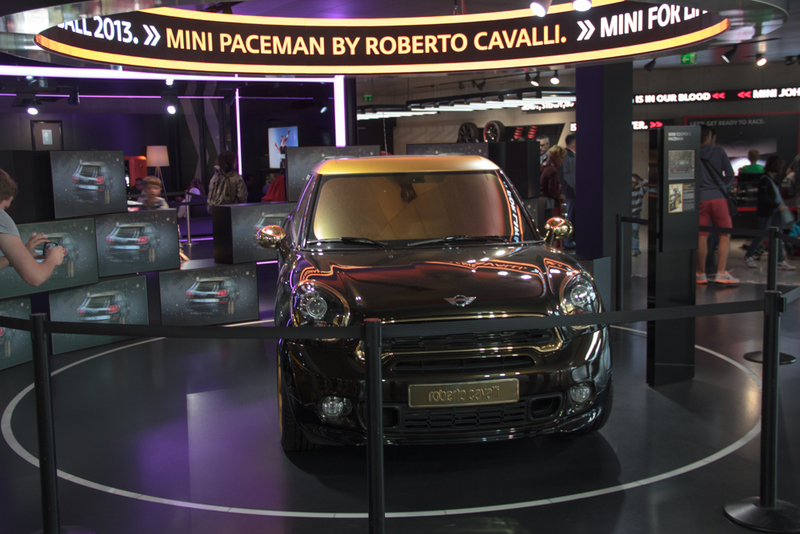 It showcases the company’s cars and a lot of people bring their children there because there’s a lot of interactivity. There’s also a full service restaurant upstairs. I found it all to be kind of underwhelming. It was an interesting way to kill an hour, but I can’t imagine spending much more time there. I think this is a place for people who love cars. I’m not their target audience. 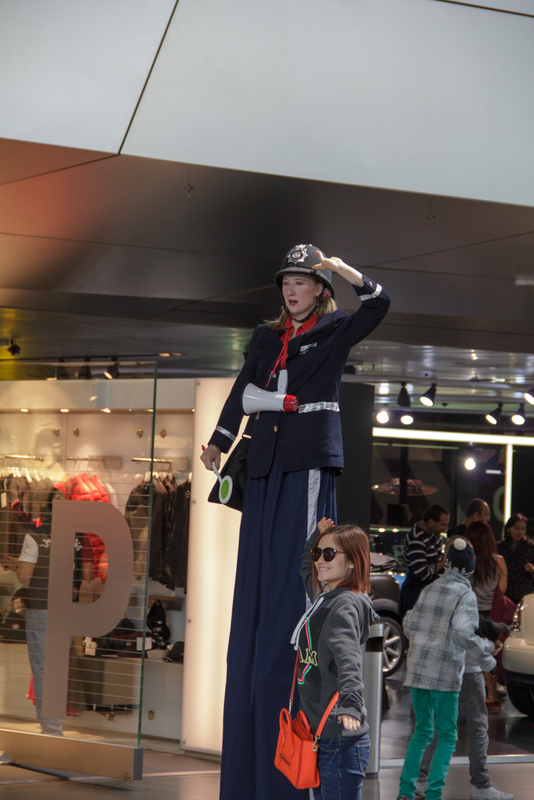 There’s some random kid-oriented stuff like this stilted police-woman. In the kid’s section, there was a giant contraption with balls on tracks racing around the wirework in the center. I watched this for quite a while because it was kind of fascinating. There’s a giant Mini section. (LOL, I said “giant Mini.”) You can sit in most of the cars- only a few are behind ropes like this. For no reason I can adequately explain, there were a bunch of little girls in yellow and black facepaint on inline skates. The facility is kind of like a giant showroom. The deck on the top right in this photo is brand new BMWs which are awaiting pick-up from their new owners. BMW-Welt is right next to the BMW headquarters, so picking up your new car here is something of an honor, I think. That tower there? That’s the BMW headquarters. 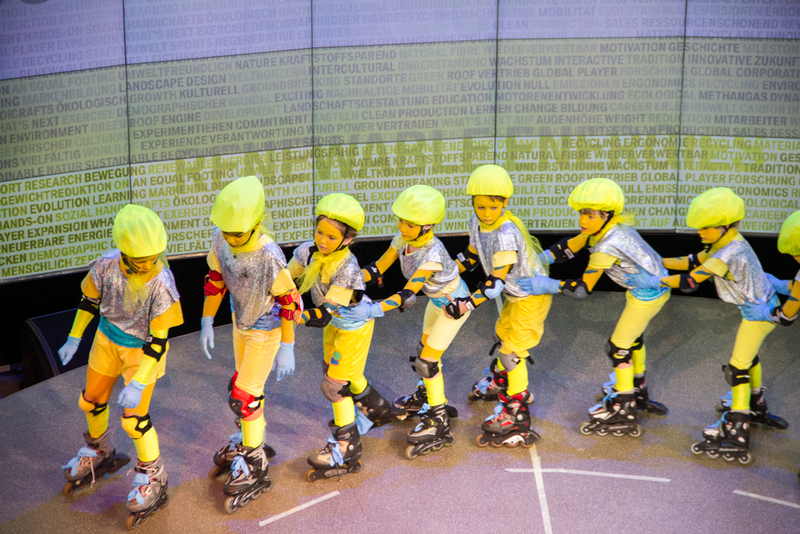 Here’s another shot of the yellow-faced kids on wheels, because why not. 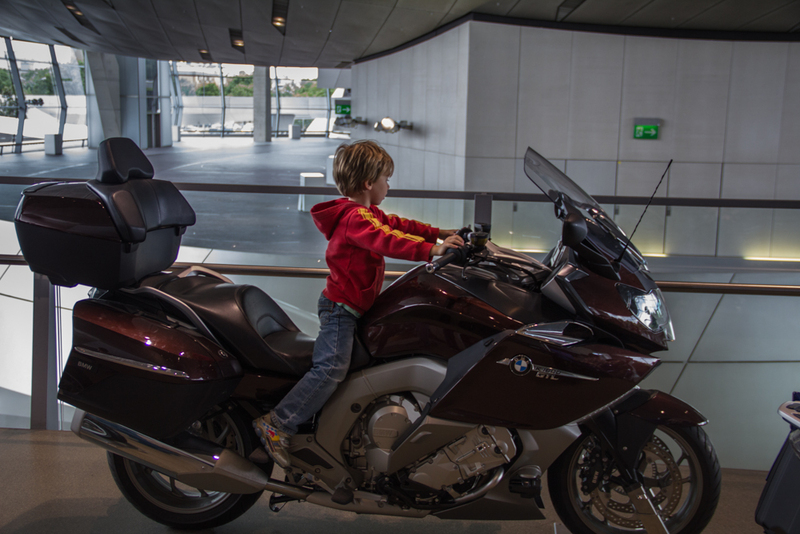 There were also several rows of BMW motorcycles bolted to the floor so that you could get on them and see how it feels. 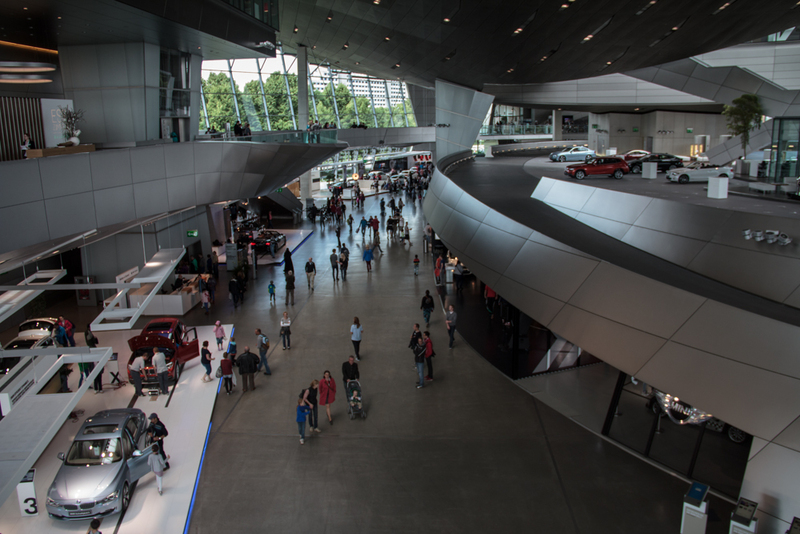 Have you ever been to BMW-Welt? Did you get in any of the cars? Picking up your new car there is the BMW-version of a “plant delivery” (I’m not sure, if such a thing exists in the US) – you get to pick up your new car at the plant it is delivered, this includes a tour of the facility and (almost) nobody driving your shiny new car before yourself (that’s the main motivation for a number of people). 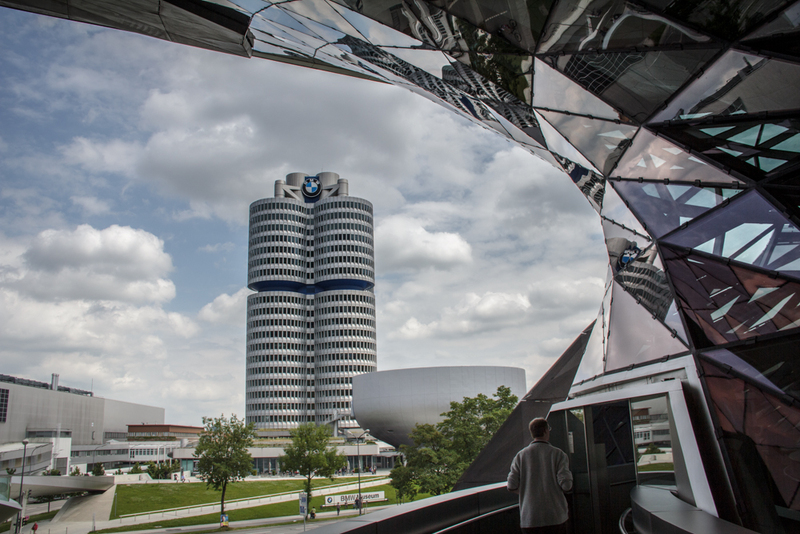 The BMW-Headquarters are also called the “four-cylinder” because it consists of four cylindrical parts. The 3 year old boy I Au Pair for LOVES to come here when we come into Munich.. He could spend all day there, but I’m with you- an hour is good for me (at the most). But you can test drive cars, too! And you get to drive them down the cool ramp inside that leads to the road outside. I’d love to do that sometime. BMW World? I didn’t even realise that such a thing existed. I must go there next time I visit Munich. 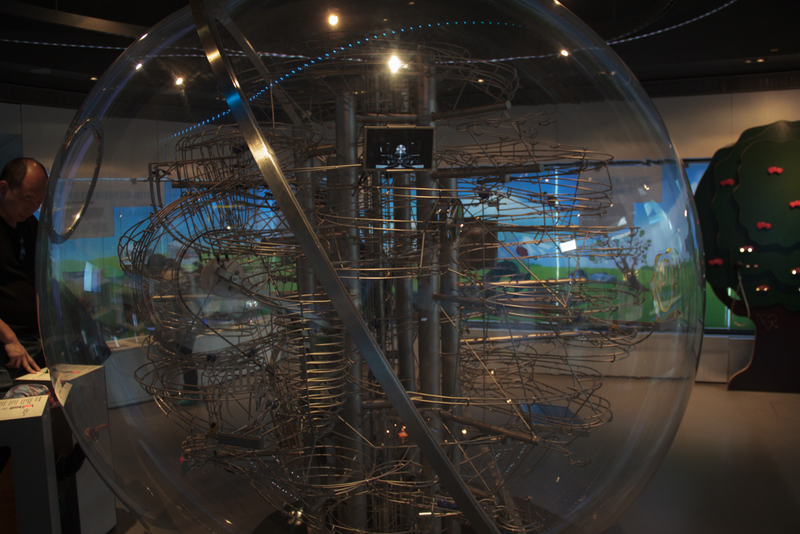 In the kid’s section, there was a giant contraption with balls on tracks racing around the wirework in the center. I love those things! There’s one here in Portland at OMSI, and there were several at …hmm…one of the many airports I was in last year.